How to tie the Artillery Loop Knot. The Artillery Loop, also known as the Harness Loop, the Artilleryman's Loop and the Man-Harness Knot (ABOK 153) is an easy to tie knot that that dates back to the days of manhandling artillery guns and horses in the battlefield. The loops that are formed were used as hand-holds or, when made large, shoulder-holds for hauling the guns into position and assisting horses uphill and out of muddy, difficult situations. Because the loop is formed on the bight of a rope multiple loops can be formed along a length of rope. However, tension should be maintained on the loop to prevent the knot from slipping, contracting or losing its shape. The Artillery Loop can be a useful knot for camping, boating, ranch, horse and livestock work. 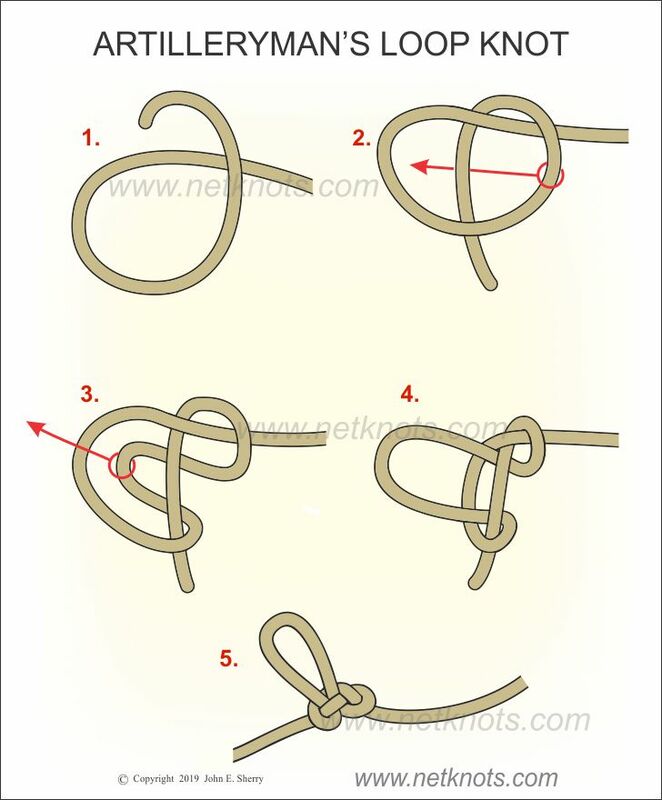 A similar knot, the Alpine Butterfly Knot is considered superior and more safe for critical applications, but the Artillery Loop is faster to tie and untie. See the animated Artilleryman's Loop below the knot tying tutorial. Form a loop with the working end on top. Continue with the working end passing under the loop just formed. Hold the working end in place and grasp the right side of the loop and bring it under the working end and over the other (left) side of the loop. As you pull it out of the original loop it will then form the new loop of the knot. Work the knot tight and then pull firmly on the loop to set the knot in place. Note that if a larger loop is desired, start the knot with a larger original loop.